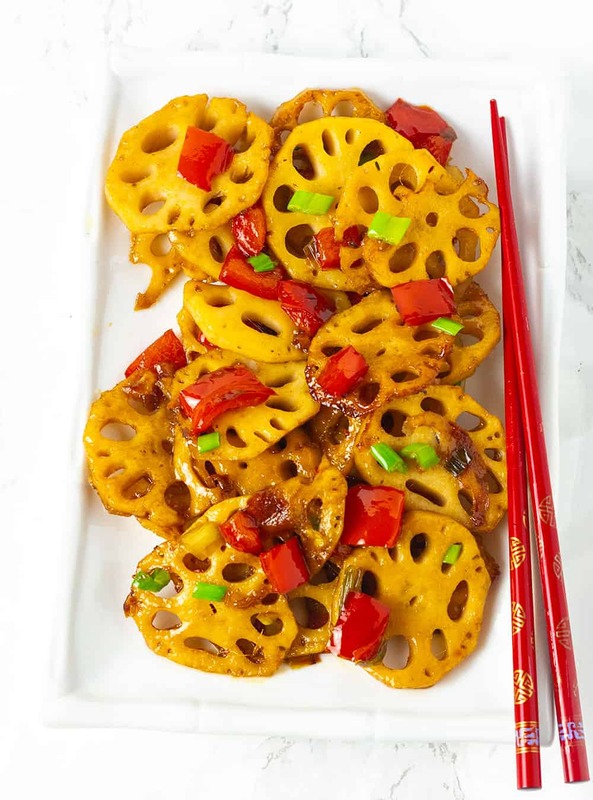 Amazing Stir Fry Lotus Root is so easy to prepare, crunchy and tasty with bell pepper, garlic, ginger in a flavorful sauce. Delicious served with rice. 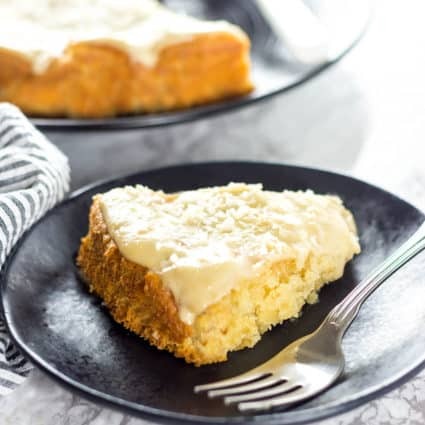 This recipe was first posted January 21, 2015, I decided to do an update after my recent weekend trip to Orlando. On our way back we stopped to shop at a Chinese supermarket in China Town. I found lots of lotus root and instead of making another lotus root recipe, I decided to first give my old recipe some TLC. Lotus root is actually a perennial rhizome of the lotus flower, where it grows underwater and has segments that look like sausages. The entire plant is edible but the root is commonly used in Asian cuisines especially Chinese and Japanese cuisine. What Does Lotus Root Taste Like? Lotus root has a delicate, sweet taste and a crunchy texture. It is usually added to stir-fries, soups, curries, and stews. In soups, it has a softer texture but stays firm. Lotus root is very nutritious, it is low in calories, 100 grams is only 74 calories. It is an excellent source of fiber, 100 grams has 4.9 grams of fiber which is 13% of the daily requirement. 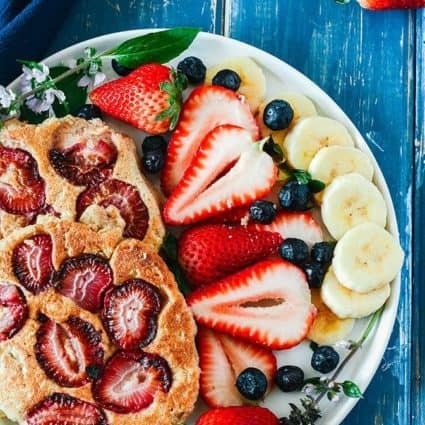 It is an excellent source of Vitamin C, 100 grams provides 44 milligrams or 74% of the daily requirement. It also has B-complex vitamins, copper, magnesium, zinc, iron. Lotus root aids digestion promotes weight loss, regulates blood pressure, reduces stress. 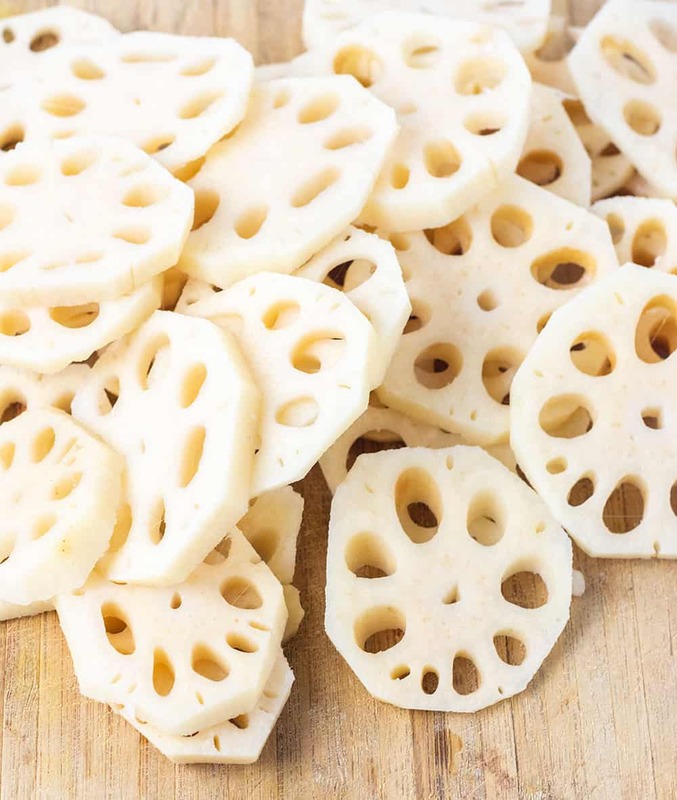 Where To Buy Lotus Root? 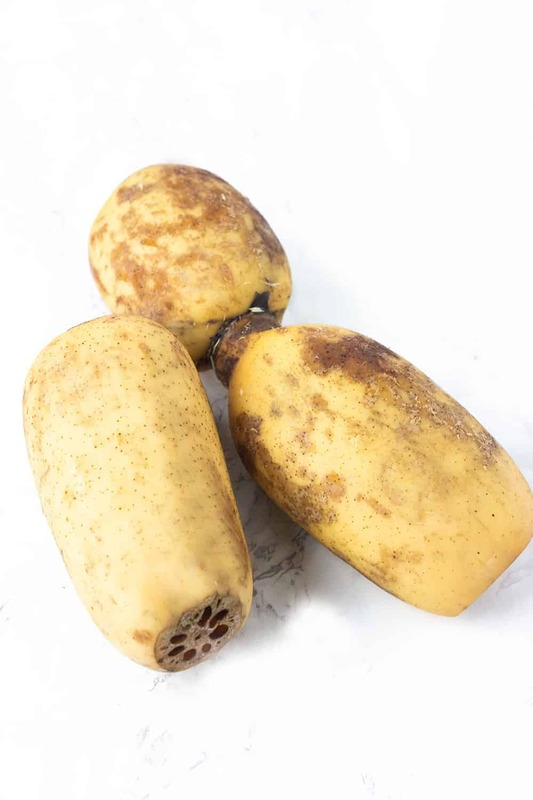 Lotus root can be purchased from Chinese or Indian supermarkets. 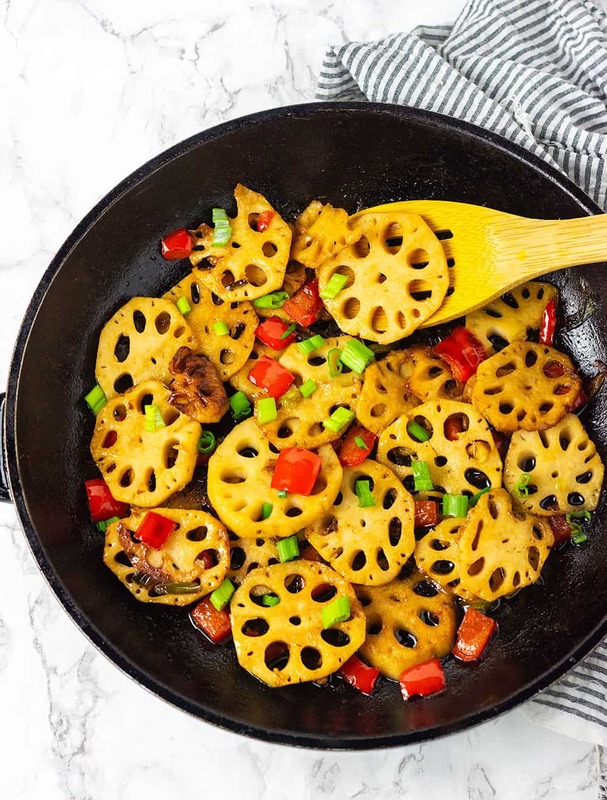 How To Stir Fry Lotus Root? Add garlic, ginger, green onions, bell pepper and saute until fragrant. Stir in lotus root slices and sauce. Cook until sauce thickened. Add cayenne pepper and garnish with sesame seeds and remaining spring onion. If the lotus root is linked like sausages, cut the links. Remove the tough ends and discard. Peel it just like you would peel a potato. Cut into thin slices crosswise to reveal its beautiful spoke wheel pattern, about 1/8 inch thickness, then submerge into cold water with vinegar or lemon juice added to prevent oxidation. Drain lotus root. Fry lotus root slices in oil until lightly brown, for about 5 minutes. Add bell pepper, garlic, ginger, green onion and stir fry for 1 minute. Stir in the sauce and cook stirring until thickened about 2 minutes. 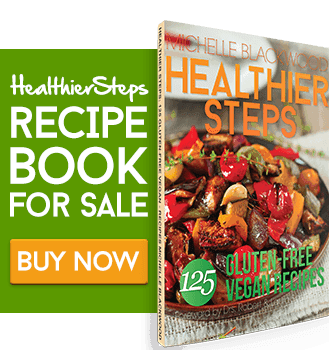 If you make this Stir Fry Lotus Root recipe, snap a photo and hashtag #healthiersteps — we love to see your recipes on Instagram, Facebook & Twitter! Meanwhile, prepare all the veggies, bell pepper, garlic, ginger, green onion, and set aside. 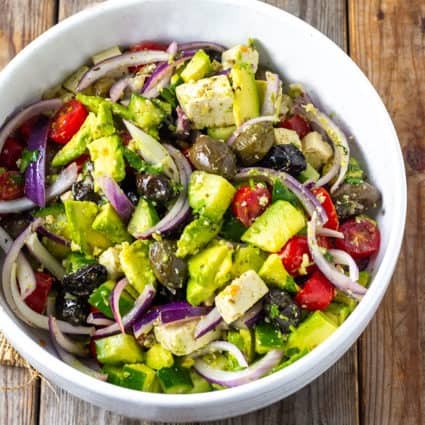 Combine sauce ingredients, vegetable broth, maple syrup, Bragg's Liquid Aminos and sesame oil in a bowl. Add garlic, ginger, green onions, bell pepper and saute until fragrant. Stir in lotus root slices and sauce. Cook until sauce thickened. Add cayenne pepper and garnish with sesame seeds and remaining green onion. Thank you for sharing this, it was so amazing! I’m so happy you enjoyed it Kathy.